God of Carnage is a comedy without manners. It begins as a civilised conversation between two couples as they discuss an altercation between their children. Yet, despite the symbolism of congenial domesticity represented by a well-decorated table centre-stage, something is amiss. The pastel coloured lighting is so intense that it disrupts any sense of a wholesome atmosphere, while the facial expressions of the actors as they politely respond to the other characters suggest a concealed disagreement verging on anger, ready to explode at any moment. When the explosion happens, the ideological compasses of each character are attacked; homemade dessert is vomited over valuable rare books; a mobile phone is dunked into a vase of tulips in a fit of rage; and Annette, who arguably begins as the most rational character, breaks down onstage as she becomes more inebriated on expensive rum. The ‘God of Carnage’ – be it the playwright who creates the situation, the director who orchestrates the actors, or an unseen deity evoked sardonically by Alain – slowly destroys the illusion of façade, with both couples questioning their marriages, middle-class ‘manners’ replaced with physical fights, and actors even stepping into the audience to remove the traditional distance between our lives and those that we spectate. Indeed, for this production, the first two rows are sofas that resemble the one onstage, enhancing this Brechtian collapse of stage and audience which, combined with the intimacy of The Record Factory staging area, forces the audience to be as much a part of the play as the actors themselves. 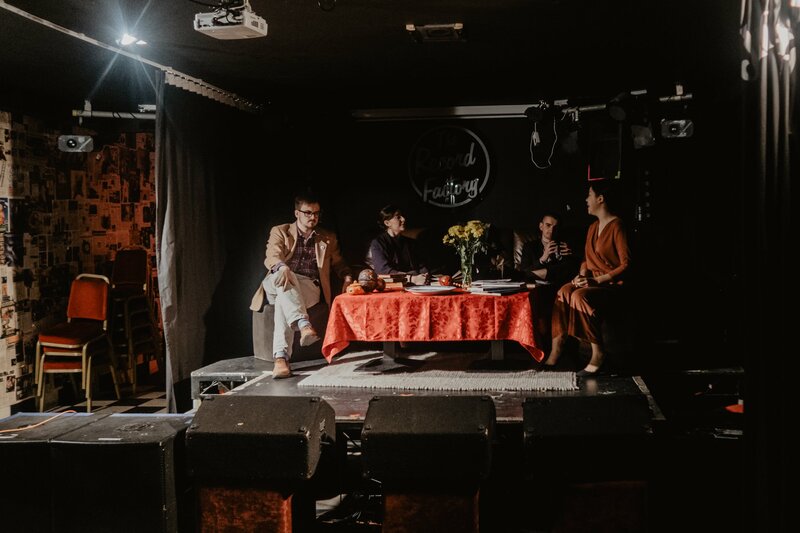 The venue, however – while fully utilised by a company on a student theatre budget – does have certain practical issues. Though the performance space is fenced off from the bar area by dark curtains, the noise of customers sometimes disrupts the performance. This is particularly jarring for a play like God of Carnage, since much of the humour stems from acerbic remarks delivered after a lingering silence. Overall, despite the abrupt ending, and some of the jokes failing to land, the sensitivity of the actors to the dramatic complexities of the dialogue shone, with farce skilfully transitioning to intense contemplation and back into farce. God of Carnage may be a comedy of errors, but only a couple of adjustments would turn this production into a faultless one.